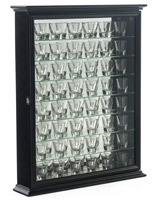 Where can shot glass display cases be used? These wooden collectible displays are perfect for decorating a public bar and restaurant as well as your home. Each rack is holds multiple glasses. One distinctive feature that differentiates these collection cabinets are the high quality craftsmanship that goes into each product. Another great feature is the perfect sizing of each slot. Taller slots are also great for specialty shot glasses. Shot glass shelves are commonly used in bars and restaurants for a variety of different reasons. Whenever you find yourself in a tourist hot spot, you might note that a lot of the restaurants, clubs and bars also have a gift shop attached. Shot glasses are a huge collector's item and any popular restaurant will definitely want to display them where customers will be more likely to make a purchase. Hang them at eye-level to draw more attention. Showing off collections at bars can really add to the environment by making it feel more fun and welcoming. What are some standout features available with these shooter racks? 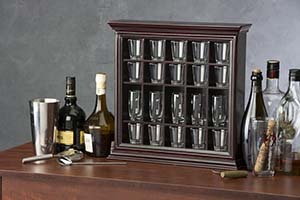 The shot glass display cases are made up of wood or acrylic with difflerent colors available. Acrylic shelving units come with aluminum standoffs for wall mounting. Instead of using a regular shelf where you could place six to eight glasses deep where you cannot see most of them, these collectible shelves are more effective and particular to collectors need. There is no need to look for adjustable shelving or building your own shot glass shelves because these holders have rows that are 4.5” deep to accommodate larger glassware. The acrylic line of cabinets can hold 6 glasses per row. 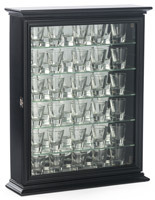 This means that with a 4 shelved cabinet, 24 small pieces of bar glassware can be held. 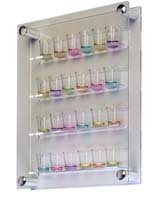 The acrylic shot glass display cases are great for wall mounting use, coming with standoffs that attach to a front safety piece which will hold everything into place. You can also place lighting underneath the acrylic holder to illuminate the glasses and shelving to create a unique ambiance. Make sure that wall anchors are used when installing the cabinet unit. You want to make sure that you have a solid foundation for the cabinet to hold properly. What are some other uses for a shot glass cabinet? Miniature toys from around the world are popular. People also colect bottle caps from their favorite drinks. Signed golf balls fit perfectly into the wood units. Collectible thimbles will look great on any one of these shelves. Other trinkets such as mini Russian dolls and other favorite personal items will look great in your home or at the office. 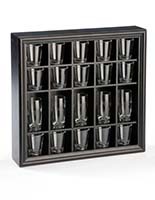 The shot glass display cases have multiple ways to be presented in a company or home setting. One way is to place the rack holder on any countertop or desk setting. It is recommended to place the shelving unit against a wall or flat surface to prevent it from moving. With most of the solid wood boxes there are hangers on the back to easily hang it on the wall in your bar or home. The triangle hooks are strong and will hold more than its weight with the glassware. Just make sure that the screws are planted well into the wall. The acrylic line comes with standoffs to accent the display case. Each screw for wall mounting will be screwed inside of the standoff and to your wall keeping a simple and clean look for your place of business or home. The wooden shadow boxes have an interior depth 2.5” with a wooden backing. Interior sizes of the box differ from 2.5” x 2.5” to 4.5” x 2.5” to accommodate regular sized and double shot glasses. Not only can you fit your favorite shot glass in the display case but also a favorite 1.7 oz. liquor bottle, also known as a "nip". Some finishes include high-gloss mahogany, gloss black and matte black. Don’t worry if you don’t have enough shot glasses to fit into every cubby hole right away. If you spread the jiggers throughout the wall mountable shelf it will look just as good as if it were full. Your collection will grow and so can your shelving layout by combining multiple cabinets. 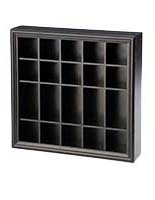 The front-loading display comes with a great looking base and top crown molding. This gives the product a more distinguished look and becomes more of an attraction than a regular shadow box. There are also some cabinets without a base and top crown but still have molding for an upscale look. This specific casing is great for adding more either now or later for an extension or in addition to your collection of shot glasses you want to share at your bar, restaurant, home or office.